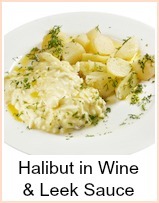 I love halibut - it's one of my favorite fish. So meaty and tasty - some people say it has the best texture of all fish. This method of cooking will keep it moist and succulent. 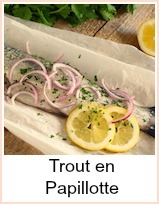 It's one of the more expensive fish, so you'll want to make sure it's cooked perfectly - think 'fillet' steak as opposed to 'stewing' steak when it comes to price - also, you won't need a massive portion as its flesh is dense. 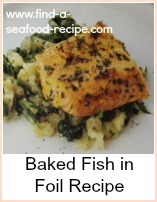 Serve with some buttered potatoes, plainly boiled vegetables and perhaps some garlic mayonnaise. You've already got some braised leek and carrot in the parcel, so a green veg, such as beans, peas or broccoli would go well to add some colour. Take four pieces of aluminium foil and brush with olive oil. Divide the vegetable mixture into four as you're doing individual parcels. Take the leek and carrot and put on the bottom of the foil. Season and then put a halibut steak on top. Then sprinkle with wine, lime juice, rind, pepper and parsley. Seal the parcels and bake for about 25 minutes. This halibut recipe would adapt for any firm white fish - basa, tilapia, mahi mahi - or something a little more common like cod or haddock - your choice - but enjoy. 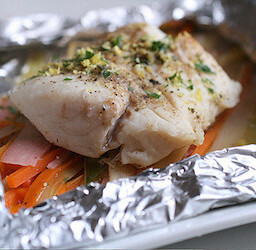 This Halibut in Foil Parcels recipe is so meaty and tasty.